This Myanmar family holiday delivers you an opportunity to take your bikes to explore this beautiful country, encounter kids at every turn and have lots of time to interact and to learn from each other's company. 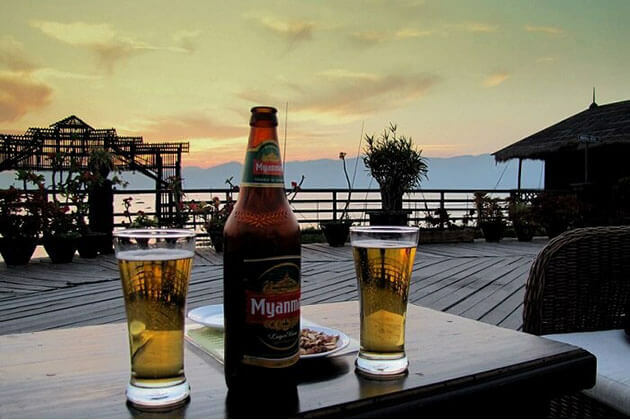 We spend Myanmar family four full days in the Inle Lake and Shan Hills area where sleepy villages and picturesque lake and mountain views greet us. We explore the rural heart of this region by boat and bike and get an appreciation for the challenges facing those who live here as well as the rewards. The second part of our adventure takes us down to the Irrawaddy Basin and the flatter, drier areas from where successive kings have ruled this majority Buddhist country. You can arrive at any time before 3:00 pm today. A driver will meet you on arrival and bring you to the hotel. We meet in the late afternoon for a briefing, followed by a visit to the most important religious monument in Myanmar, the Shwedagon Pagoda. We learn about the intricate history and significance of this towering, gold covered Pagoda and enjoy an unforgettable sunset here. A delicious Burmese dinner awaits. 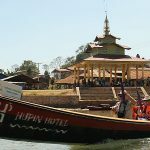 After an early morning walking tour of downtown Yangon, we take a late morning flight to Heho and a short drive onto Nyang Shwe, the main Inle Lake Town. We will be staying on the dry land next to the lake rather than on it. This gives you the freedom to explore the area by bike in the afternoon with your guide. We take a ride around the area to learn a little about the local culture and the farming habits of the people here. We then cycle along the western bank of the lake, before taking a boat trip on the lake itself. 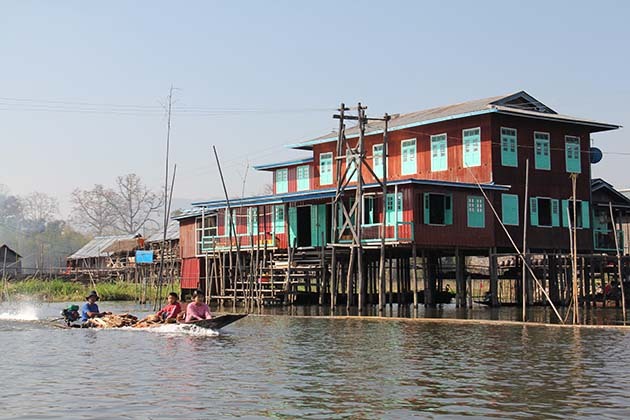 Here we will see leg-rowing fishermen, silk weaving, silversmiths and whole communities that exist in stilt houses on the lake. Everything from schools, shops, even basketball courts can be found out here, all within a short boat ride of each other. Today we make our way into the Shan Hills but not without one last ride along the lake where we’ll have little traffic and the chance to see local villages and perhaps even a rotating market. 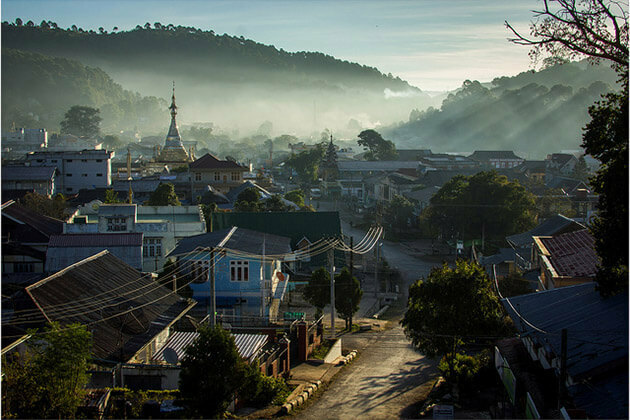 We’ll pack up the bikes and drive 2 hours to Kalaw, a former British Hill Station and home to an astounding mix of people, from descendants of Gurkha soldiers to Bangladeshi immigrants, ethnic Pao O and Burmese. All share this picturesque setting with a small, but fascinating market at its center. We explore the market on foot and then if you wish, jump back on the bikes for a pedal around the town to see some of the remaining British influenced buildings. The Shan Hills are noted for their fresh produce and tonight you’ll have a chance to try it at a family run restaurant. After a short drive, we start our walk on well-worn trails through the forest. We pass small villages as we descend, eventually arriving at the Elephant Sanctuary. Here a dedicated team has established a natural reserve for working Elephants to retire to. The sanctuary, in its third year of operation, also serves as a reforestation project to provide further habitat to the elephants. We take a walk here and hope to see some of the residents. After spending some time with these majestic creatures, we have lunch at the sanctuary HQ and then return to Kalaw by car. Mandalay was the last royal capital of Myanmar and was the first city to be ransacked by the advancing British forces. The former Royal complex was destroyed in a fire during World War II, but you can still see the impressive walls and moat. 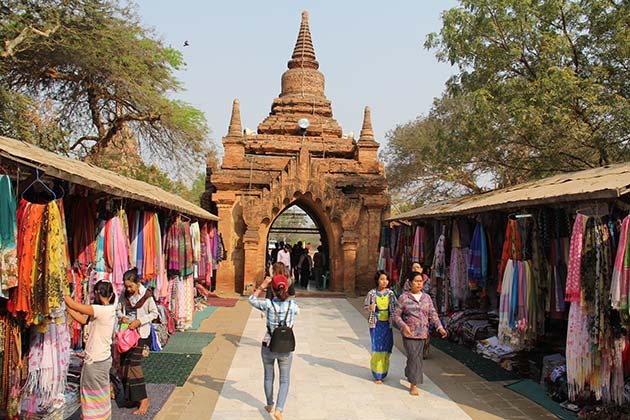 The city of Mandalay is now a bustling commercial center with fascinating local markets. We touch down in the late morning and then have the afternoon to wander on foot and explore the town. We take a bike ride beyond the bustle of Mandalay to see the villages that exist around the periphery. Here we find a peaceful way of life, centered around the cycle of the farming seasons and traditional life. In the dry season, while the land lays fallow, the villagers dedicate their time to traditional crafts such as making robes for monks, snacks to sell in the market or other skills that have been passed down to them. After lunch, the rest of the day is free for you to relax and enjoy the pool or explore on your own. We take to the bikes and ride the back trails of the Mandalay region this morning. 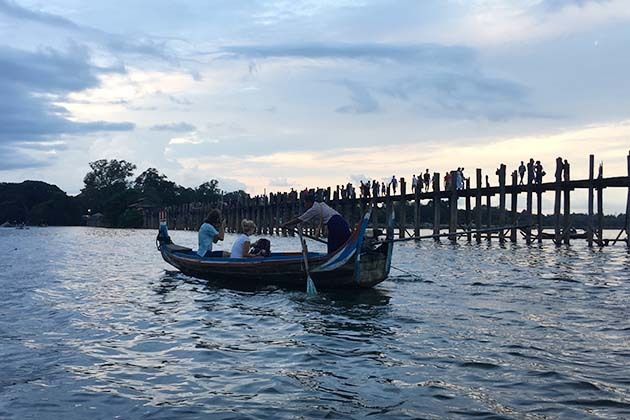 We pass by ruined pagodas dating back to the heyday of Amarapura and we discover the Muslim enclave that is home to the descendants of Mayor U Bein who built the longest teakwood bridge in the world. We finish at this bridge where we have lunch before driving onto Myingyan, a small town of little note, but perfectly located for us to break our journey for the night. 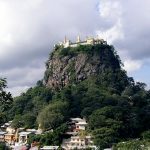 After driving some way towards our destination, we find our bikes and detour through the villages surrounding Mount Popa. Depending on the time of year, you will see various crops, maybe even sunflowers or tamarind. 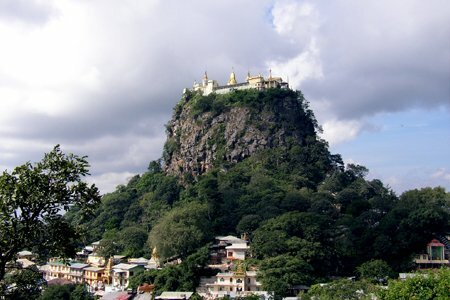 We are then back into the vehicle for the drive up to volcanic Mount Popa, home of the 37 Nat. 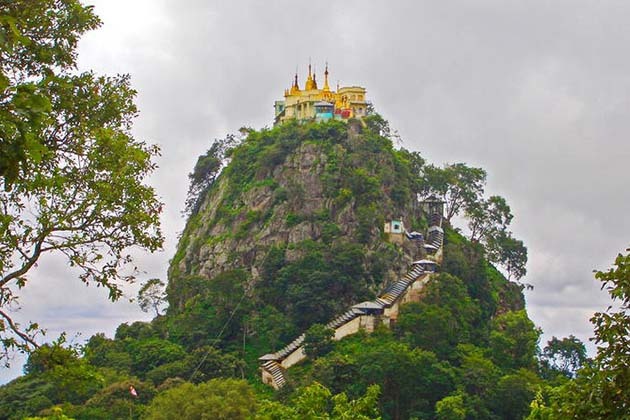 Our hotel is the Mount Popa Resort with a clear, fresh pool and a view of the hill-top temple. In the afternoon, those wanting to get up close and personal with the tales of the Nat spirits can join your tour leader for a visit to Taung Kalat. Those who enjoy big downhills may like to enjoy this one before we drive onto the Bagan area where we cut short and take a lovely ride through the villages of the dry zone area. 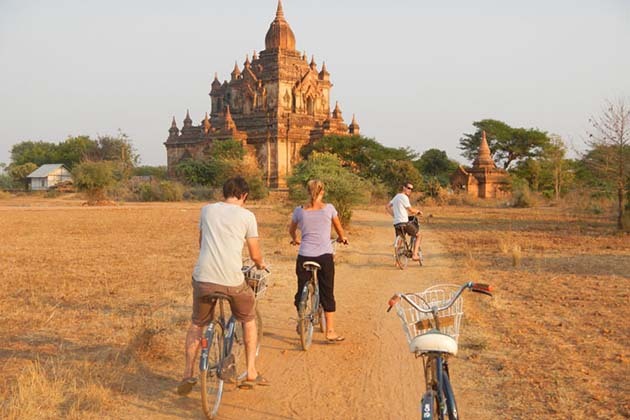 We encounter palm sugar production and various other food and craft production as we pedal the sandy trails into Bagan proper with its beautiful panorama of the pagoda speckled plain. The pagodas of the Bagan Plain are best visited early in the morning as the sandy landscape heats up by the middle of the day. We make good use of an early start and focus our visit on the temples that were built between the 14th and 19th centuries: Shwezigon, Sulamani, Htilominlo, Dhammayazika. In the late morning, we find a shady tree to enjoy lunch under and then have an afternoon for free time before we find a quiet view to enjoy a peaceful sunset overlooking the pagodas. A free day for you to relax, take stock of the great adventure and enjoy this enchanting location. The hotel is well located for more exploration and has a nice pool for those who have had enough exploration for the time being. Burmese massage is also highly recommended. We make an early start for our five-hour drive to Mandalay. Those departing today can be taken straight to the airport. For those wanting to spend more time in Mandalay, we will take you to your hotel. Time will be free until our car arrives at the hotel to take us to the airport in good time for our homeward departure flight. Tour ends. 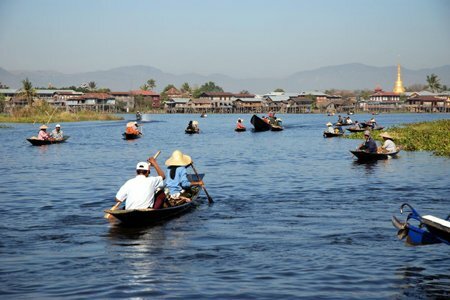 Boating in Inle Lake, Myanmar. 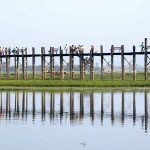 U Bein Bridge – The Longest teakwooden bridge in the world. Family in their cycling trip in Bagan, Myanmar. 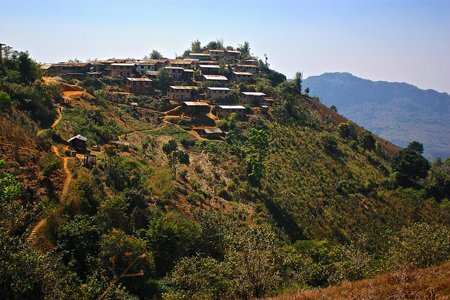 Kalaw – A former British Hill Station in Myanmar. Do you offer any discounts if we are a large family group? Yes, there more people travelling, the cheaper it will be. We will offer a group discount if you have more than five people travelling. 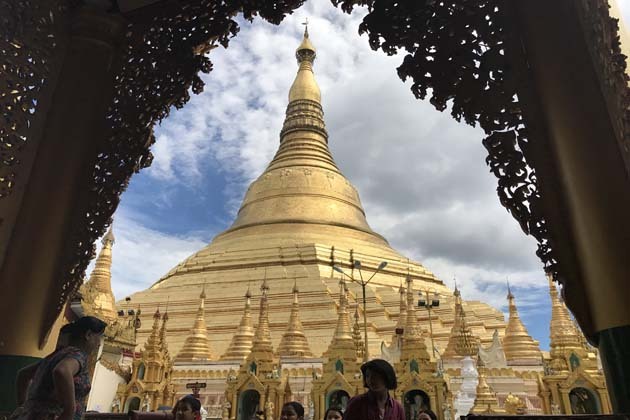 Is Visa fee included in your Myanmar family tours? Visa fee, international flight as well as airport tax are not included in our Myanmar family tours. What will you recommend for family group with around 10 days in Myanmar? We plan to visit Myanmar in July, 2015. With 11-day family trip in Myanmar, we highly recommend tour Myanmar Family with Nature & Culture. The tour will allow us to discover most popular attractions in Myanmar such as Yangon, Bagan, Mandalay, Inle Lake… We also prefer customize tours, if you do not find any suitable tour, please fill out our customized form to suit your price and interest. Our family is considering choosing Myanmar for our vacation in June. Can you recommend us some tours including the beach in itinerary? It quite depends on your time you will spend for Myanmar, with 8-day vacation, we highly recommend Myanmar Family Discover – 8 Days. 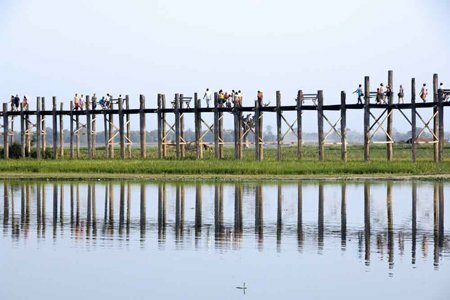 The tour will cover almost highlights in Myanmar from Yangon to Bagan and Ngapali Beach. Base on your itinerary, we will recommend the suitable one. We don’t like some destinations in your itineraries, can you customize a tour for our family? We will arrive in Myanmar on 18th May. Please fill out our customized form with number of family members and length of your stay as well as what you would like to have in your itinerary and we will tailor-made a tour that exclusively for you. What are the most interesting activities for family travel in Myanmar? What is the difference between Family Tours and Normal Tours? For normal tours we offer many options to meet the needs and interests of people. For family tours, we understand that the needs and interests of the family in a vacation are completely different from other tours and we have tailor-made the tour itineraries combining among traveling, fun and relax and focus to make all the family members to have quality times together. What type of accommodation you suggest for your family tours in Myanmar? Depend on the package you take, that you can get the different standard. 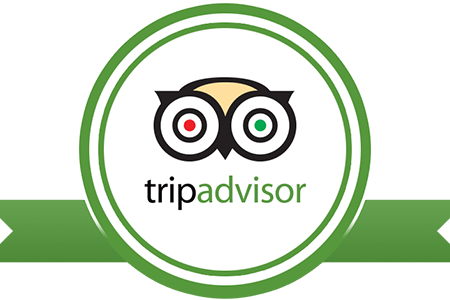 But we only suggest the tours, the hotels from 3 star up. With family tours, we always try to find and offer the hotels or resorts with pools, you children will love water. We will arrange the family rooms or joining room for parent can easily pay attention to their children but still have the private times. The accommodation or hotels we offer is usually centrally located for your convenient. Will we have private tour guide if we take your family vacation? Of course, most of our Myanmar family tours are for private, the guide/s are very professional and have the knowledge of family needs and interests. We will offer you private guide/s and drivers at your services. We have an infant; is it possible to start our tour a bit later than the itinerary? Yes, you can. When you take our private tours the time is completely yours. You can entirely start your trip later than other group tours. Can we have baby seat on van during our family trip? Of course, we will arrange the baby seat on van during the whole trip. Is it safe when our children play with local children in Myanmar? I am a bit concerning about hygiene. Let your children communicate with local children is a good way to help them find the way to break the barrier, you will see that the children make friend very quickly even when they have different language. Depend on many aspects that you can allow your children to play with the local children or not. We always arrange the tour to clean places for your family, therefore, do not worry too much about hygiene. 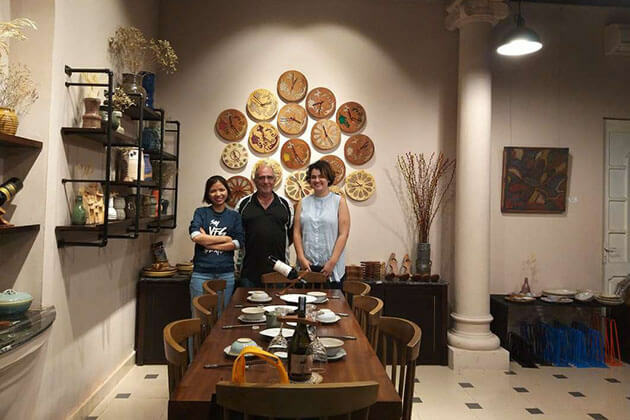 What about the dinner for your family tours? Is it good? We have created many programs and itineraries for family vacations including the meal with local family. Our clients and their children are very happy when they have chance to communicate and experience the great time with local family. We strongly recommend you to take that as a part of your family tours in Myanmar. Do you offer local homestay for family tours in Myanmar? Yes, we do. Homestay is one of the most memorable experiences for family in Myanmar. We have dropped you more information about family packages including homestay, please check. Can we cover all the most popular attractions in Myanmar when we take your family vacation as other tour packages? 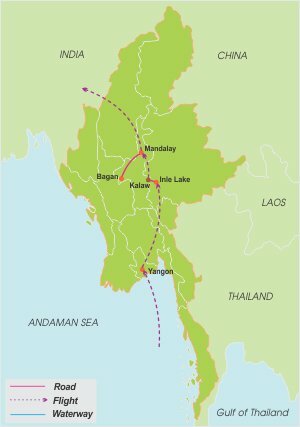 What is the longest itinerary for family tours in Myanmar? The longest itinerary we tailor made is 14 days maximum. Our longest tour is Myanmar Family Adventure Tour – 14 Days. Besides, we also provide many other package vacations for family with a variety of options. For more information as well as customized tours, please contact us. Is it possible to take a package vacation for family with your company? Of course yes, we are pleased to be your favorite tour company in Myanmar. With many years in operating tours, package vacation, private holiday…we are professional at provide Myanmar tour packages with many options for your choice. We have dropped you more information about family tours in Myanmar, please check your inbox. We are traveling as a family of 4 people with 1 small kid. We plan to visit Myanmar in October. But we just have 4 days or little bit more in Myanmar. May be it is not enough time for whole country tour. Which place in Myanmar is most well-worth to go? Myanmar is a great country for family vacations, there is many things to see and explore with your family. With 4 days in Myanmar, we recommend Bagan. You will cover the most highlights in and around Bagan including Balloon Over Bagan to see this ancient city from bird’s eye view. How flexible is your guide and your itineraries for family tours in Myanmar? Since we have tailor-made many tour itineraries for family in Myanmar, Vietnam, Laos and Cambodia for over 10 years, we understand very well the needs of the family vacations. We know that the children can get tired and feel bored, very fast so we do not stuff too many activities in the itinerary but we try to balance between: activities, relax and fun that make every member of the family could take part in. 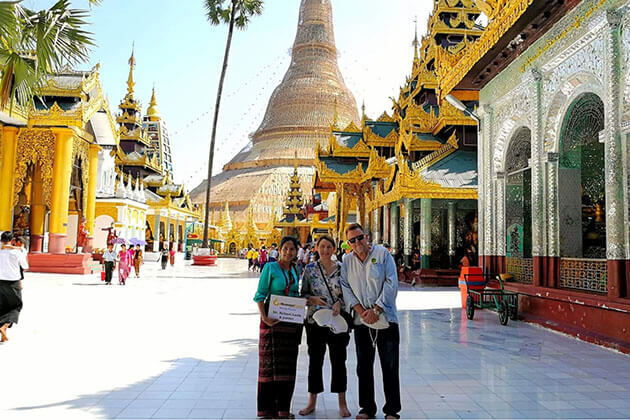 Furthermore, our guides for Myanmar family tours can be very sensible and creative that make the children will enjoy all the activities in the trip. 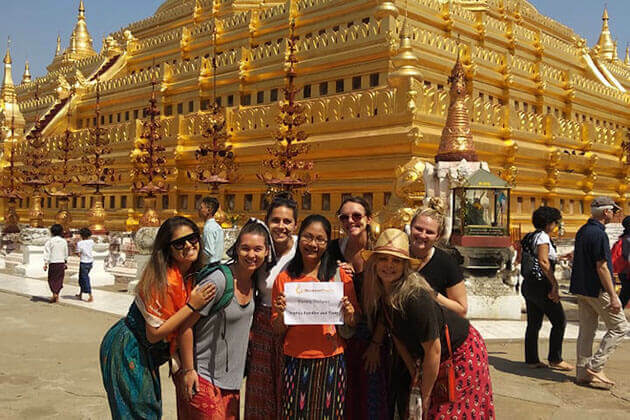 At Go Myanmar Tours, we not only tailor-made itineraries to suit your vital needs but offer flexibility for destinations, timing and activities, even on the day you can make changes! We offer you the opportunities to adapt the weather, your children’s needs, and changing interests. We strongly believe our professional guides are the most fun, flexible and caring in Myanmar. Every Myanmar family vacation itinerary in our recommended list is specially designed to make all family member at all ages will treasure. We offer something special for the whole family members, talk to our travel expert for more ideas and create a unique tour just for your family. This is your family vacation and you can entirely to do it your way. Contact us now to get trip of a life time with Go Myanmar Tours. Are the particular outdoor activities in Myanmar safe for kids? 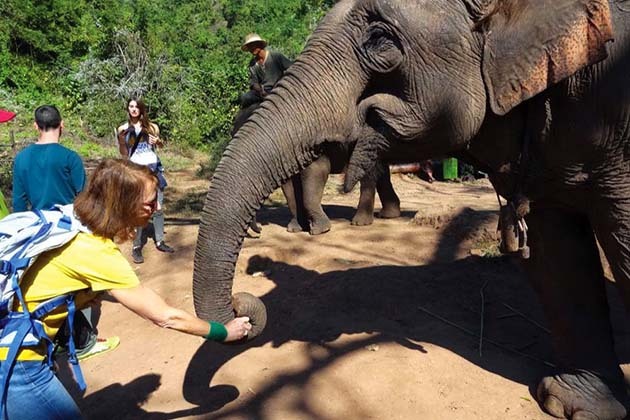 Yes, we consider safety is the most important in our tour itineraries, so those our door activities are suitable for children and operated at most care. It depends on the ages of the children, so we will offer the suitable program for them with most interesting activities but safe. Our tour guide/s will ensure your children’s safety during the tour. I am concerning about the food, will my children like Burmese food? Yes, they do, Burmese food is very good and most of the children in our tour enjoyed it much. Furthermore, there is an enormous choice of food available in Myanmar, including Western food, fast food, sea food and vegetarian food. Each meal, there are normally 3 to 5 courses, so it is almost certain that there will be some dishes your children like to eat. Our guides are experienced in helping select Burmese dishes that the children will like. In some cases, if you need any special food, please inform us in advance and we will surely arrange those food for your family. How about the accommodation for family travel? In order to ensure you enjoy your stay in Myanmar, our experts have carefully selected hotels and resorts that meet the family needs. We also consider the factors like our clients’ feedbacks, trip advisor’s reviews, the good location, accommodation with swimming pool and connecting rooms… to offer your family the best vacation in Myanmar. 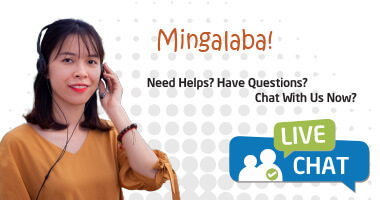 Could you tell me how many days is sufficient for family to cover all highlights in Myanmar? It takes you 14 days for your family to cover all the attractions in Myanmar with fully memorable joys and experiences. You can also extend more time in some famous sites, please inform us in advance. How many days should we spend on our family vacation in Myanmar? It depends on your travel dates; we can design a customized tour which is suitable with your time such as: 5-day family tour, 10-day family tour or more, please on request. Are there any dishes for my children in Burmese restaurant? They are quite small. We would be traveling Myanmar 3 adults (one couple and one single female adult) and 2 children (aged 9 and 12), do you have any family tours for our group? Yes, we offer many package vacations in Myanmar for family traveling with kids. Activities in tour are balance between free times for families and your interests around meal times. I assume our package is a private tour then in a 16 seater van? Meaning not joining others but just my family of 8 people? Yes, all of our tours are privately customized for family travel, remember that you family will NOT share with others with a 16-seat car for your family and your luggage. Can we leave children alone for a while when getting out for some drink? Is it safe for our children when I leave them in the hotel? A family group with 1 10-years-old boy and 12-years-old girl. Your children are quite big enough to understand what you tell them, you can ask hotel staffs for looking after them for a while when you go out. Can you customize tour for family vacations in Myanmar? Yes, of course. If you don’t feel comfortable with tour packages or time, please let us know and we will help you tailor-make a special tour to meet your family needs. When is the best time for family to visit Myanmar? The best time for family to visit Myanmar is the time between November and February when low temperature and pleasant weather prevail. 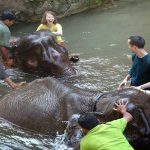 How do I expect from your family tours in Myanmar? 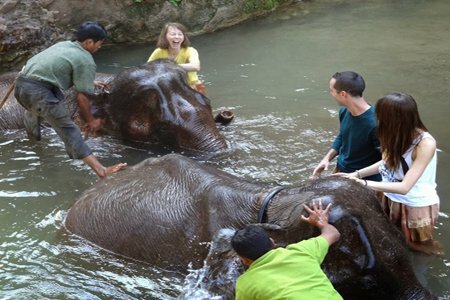 Our family tours are tailor-made to meet the need of family and with the aim of traveling can be life changing. The family tours make eye-opening and engaging for family of every age… Our family packages are designed to enrich understanding and bring all family member closer together. We take a great care of every detail of your family tours… so you can be together as a family on the trip of a lifetime. 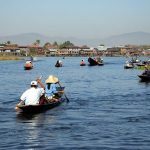 We focus in private family vacations in Vietnam, Laos, Cambodia or Myanmar or multi-country travel. So please let us know your time frame and we make it the best trip just for you and your family. Go Myanmar Tours makes your family travel in Myanmar in easiest way. All tour activities will be easy and freeing all family members to connect with each other. Why take your children on our Myanmar family trip? 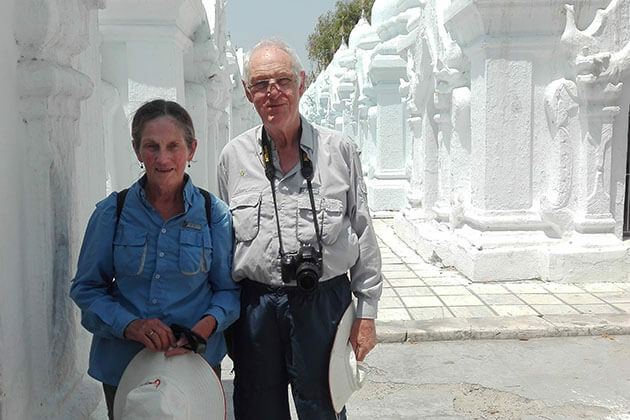 As the name, our family trips are designed just for families to discover Myanmar; the trips could be for all family members like grandparents, aunts, uncles and cousins and grand children. Each of our Myanmar family packages could be designed for all ages or parent with children or tour with grandparent and children. Is it only parents and children that can join Myanmar family vacation? Our Myanmar family tours are just for the whole family. It means your aunties; uncles and grandparents could join the trip. We offer private packages for family and will give you the best offer trip that suitable for all ages. What’s the minimum age for children on a family trip to Myanmar? We have a number of tours that could be for from 2 to 3 year old children. And many of our trips are for children at different ages. If you do not find any suitable trip, please contact us and we will give you the best suggestion or help you tailor-make a unique trip for your family. Please be noted that we will support you for steps to steps until you are happy with your tour itinerary. How do I expect for what my children earn from the trip to Myanmar with you? Your children will learn a lot from the family trip. Our family packages would give a mix of activities and education that has a lot of fun and your children would not even realize they are learning something new for the whole time. We understand that travelling is the greatest way to open up a child’s eyes to possibility. New experiences lead kids to amazing joys and interests as well as exposure to different traditional cultures and languages. Do parents and children spend all their time together on a family vacation? Parent always needs to supervise their children during the family trip. The tour guide/s on trip just tries to help but he or she is not a babysitter. My child is not an easy eater. Will there be special meals for my kids during family holiday? For family vacation, we offer many sort of food but mostly are local food and it means eating at local restaurants. The food is tasty and freshly made. There is a great variety on offer for dishes in Myanmar. Your children can try one by one. But there are not always specific kids’ menus available, so if you think your children might be hesitant to try the new Myanmar food, you should try some of the local dishes at home before you departure your country and maybe take along snacks that you know they like. Please be noted that we always try our best and give the best food for your children during the vacation. But in some cases you should prepare some snacks for your children in advance. Is there always a vegetarian option on your family package? Yes, there is always a vegetarian option available during the trip, in case you cannot eat meat and we will offer vegetarian meal, and most of buffet style meals or set menu meals will have lots of salads, rice dishes and breads. In Myanmar we offer an array of vegetarian foods. My child has a food allergy what could you offer? In all cases, we try our best to accommodate all food requirements, so make sure you advise us in advance and we can serve you and your child better. We would try our best to give alternative options available; but it may be difficult in some local restaurants in Myanmar to make sure the food is 100% allergen-free. Please be advised that you should take the same precautions as you eating out at a restaurant in your country before and taking along some snacks that you know are safe during the trip is recommended. Could you offer hotels or resorts with swimming pool for family vacation? Swimming pool is always a privilege when we choose the hotels or resort for a family trip, so we endeavor to offer your family accommodation with swimming pools where possible. Do the Myanmar family tour itineraries cater specifically for children? Almost our family tour experts are parents, have catered the trip itineraries to make sure that clients will have a family friendly pace. So on a family vacation in Myanmar, there would be balance between free times for families or they can participate in activities that suit their interests around meal times. I would like to take a trip to Myanmar in August, Any recommends for family travel? You absolutely made a right choice when pick Myanmar as the destination for family holiday. Here are some pre-made packages for you. With 9-day family trip in Myanmar, you can cover all the highlights of this beautiful country such as Yangon, Bagan, Mandalay, Inle Lake and so on. If your family likes to play outdoor activities or adventures, the 14-day Myanmar Family Adventure Tour is highly recommended, or if you do not find any interested itineraries, you can tailor-make a Myanmar tour to meet your needs. Myanmar absolutely brings your family the most enjoyable trip of lifetime. Are western standard medical facilities available during family vacation in Myanmar? In Myanmar, most of the major city like Yangon, Bagan, and Mandalay… would have most private, western style hospitals or medical center. In any medical issue that may arise on the trip, the family should consult with the tour guide or our operation and we will give the best advice. But in some cases the family should buy health insurance that cover all cases and could contact with their Insurance provider. The insurance company will advise and have a recommended medical center or hospital that has English speaking medical staff and that offers a western standard of medical care. 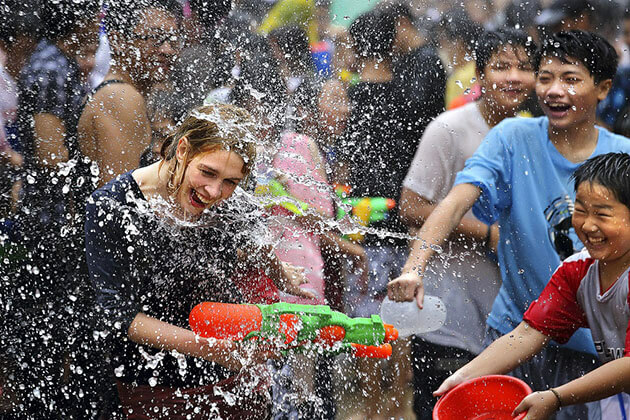 Are there activities aimed at adults on a Myanmar family tour? Our activities for Myanmar family tours are aimed at all ages, and we always endeavor to encourage all the family members to get involved. What is the best vehicle for my family to travel around Yangon? Yangon is the largest city in Myanmar, there are many things to do and see in Yangon. Trishaw is considered as the best vehicle to discover Yangon. Walking is also recommended while Yangon has a lot of pagodas and temples to visit. You can also get the taxi to get other places faster and the price is not too high. Will we have any discount for tour if we are a big family group? Yes, the cost for tours will be lower if you are traveling as a big group above five people. How about the price for children in family tours? In Myanmar family packages, the children under 2 years old will not be charged, the children from 2 to 5 years old will paid a half of adult rate, three-quarter charge for children from 5 to 12 and full of charge for over 12 years old children. 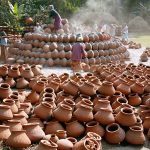 What about tipping in Myanmar? Tipping is the common one in big restaurants and hotels in Myanmar. However, some hotels may require that tips should be left in an envelope in the Gratuities Box in the hotel. Nevertheless, in some rural areas in Myanmar, tipping is not popular. Maybe, it can cause embarrassment to recipients and local people. Where can we buy kid clothes in Yangon? You can find out the thing you need for your kids in Pazundaung Market, but the cost may be a little bit expensive. Yuzana Plaza is a better choice for cheaper clothing items, about 4 or 5$ maximum for kids. We are travelling with our 5 year – old daughter to Inle Lake. We would like to rent e-bikes that have seats and seat belts. Can you suggest some addresses? E-bikes are quite popular in Myanmar; but find those with seats for children are not an easy task. However, if you still want to go around Inle Lake with your child, you can put one small plastic chairs on the back of the bike and secured it tightly. We plan to visit Myanmar with a 5 year-old boy and 9 year-old girl. Can you give us some itinerary for family vacation in Myanmar? Just a short vacation (about 9 days) properly gives your family have great experiences with activities in most popular attractions in Myanmar. 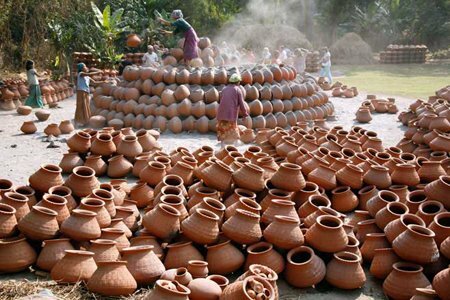 With 9-day family tour, you can cover Yangon, Bagan, Heho , Inle Lake, Twantay with a lot of activities for family bound. Plus, you can pick an adventure tour for hiking, biking, boating and a lot of interesting activities. Your children will enjoy the vacation. We are planning for a Myanmar vacation in November. Any discount for us if traveling as a big group? Of course, you can have discount as travel as a big group. The more members in your group, the cheaper the tours will be. We have dropped your more details about discount policies for your Myanmar vacation, please check. I will set off on Myanmar tour with my husband and 2 kids on December. I am looking for interesting activities that suitable for my whole family? Any recommends? Thanks. Our family is planning to choose Myanmar for our vacation in November. Can you recommend us some tours, regarding adventure activities for whole family? Depend on your time, with a 2-week vacation in Myanmar, 14-day Family Adventure Tour is highly recommended. 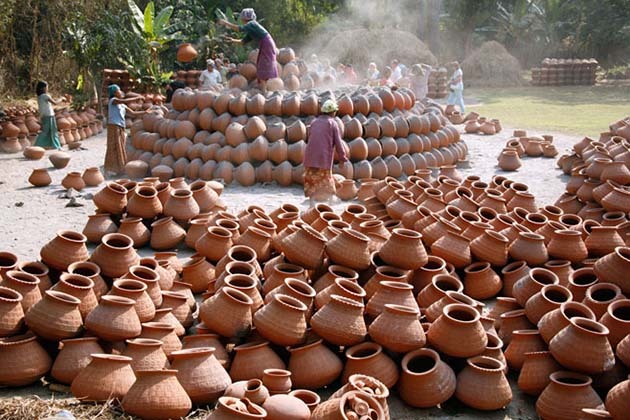 The tour will cover almost highlights in Myanmar with many activities for your family. Bike and boat in Inle Lake, cycle to Mandalay countryside, or U Bein Bridge, trek or hike Mount Popa,.. Base on your itinerary, we will recommend the suitable one. You can also customize a unique tour to meet your interest and budget. I with 2 kids (one 10 years old and one 14 years old) are going to check into Myanmar in December. I want my kids to gain a deeper insight into locals’ life in Myanmar countryside. 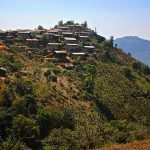 Do you offer local homestay for family tours in Myanmar? Yes, of course. A homestay experience will highlight your family vacation in Myanmar. Detailed information of some family packages including homestay will be sent you via email, please check. I am going to be on vacation in Myanmar in September. Still have to do some works, concerning about Internet access in Myanmar. In fact, Internet seems to be not reliable in Myanmar. Although you can find internet connection in some big hotels, restaurants or tourist sites, the speed is quite low and some popular websites such as Facebook, Gmail can be blocked. Our family is planning to visit Myanmar for our vacation in December. I want to rent a motor bike for my tour in Mandalay, please suggest some addresses for motor bike rental. Thanks. Mandalay is ripe with addresses with motor bike renting service, but one address can be recommended for you is Zach Benoy of Mandalay motorbikes. Motorbikes or bike cycles are always available in Zach Benoy. I will set off on Myanmar tour with my husband and 2 kids on December. What standard of accommodation for family vacations in Myanmar can I expect? We offer a good selection of accommodations in Myanmar from 3 stars to 5 star standards. Because you take a trip with your children, it is better to consider the hotels with pool. All of the accommodation we suggested is clean, comfortable and safe. I have just visited Myanmar with my family in September. We were very surprised as we saw a resident kowtowing his mother. We didn’t know what was happening. Burmese people kneel and touch the ground with the forehead to show respect to grandparents, parents, and teachers on formal occasions. Who manages the family budget in Myanmar? In Burmese family, wives are those who manage the budget of their family. Their husbands usually hands his earnings over to the wife, so that she can “make it home” or do her own small business. How many generations live under one home in Myanmar? We just got back from Myanmar on a family tour last week. On my trip, I saw that many people living in a family, which really differs from my country’s culture. Three generations of Burmese live together under the same home. If family members do not live in the same house, they usually live near each other to take care of each other. On my Myanmar family trip, we noticed that women are not allowed to head into the Pagoda. It doesn’t make sense, I contend that they deserve to get equal right with the men. What you guys saw was really true. Due to the hierarchy of Buddhism, women are excluded from certain areas of religious buildings, such as the middle platform of the Pagodas. We took the 14 day Myanmar family tour with your company, and we really had good time in this beautiful country. Thank a bunch for designing the tour. However, I can’t understand why women always walk behind their husband. Any explanations? The husband is considered the spiritual head of the Myanmar households; therefore, women let men take the lead and often follow behind their husbands or father in public. Hope my answer helps! My family with 2 kids (one 8 year old, and the other 12 year old) is planning to take a family tour in Myanmar for 14 day. But, I am wondering that whether kids are allowed to visit Pagodas in Myanmar or not? Yes of course. They are allowed to visit religious sites. You don’t need to worry about that. My family is planning to visit Myanmar next summer. But I don’t know the best time of the day to visit Pagoda? Touring pagodas in the early morning or late afternoon is highly recommended as it is cool at these moments. Don’t forget to bring along wet towers to wipe your feet after each visit. I and my parents are planning to take a one-week family tour to Myanmar. However, my parents are over 60, I am afraid that they will not be able to trek up a high mountain to visit pagodas. Are there any kinds of transport which could take them to the top of the mountain? Thank you in advance! Despite a number of pagodas sitting on the top of the mountain, they have not been equipped with cable car yet. Instead, a number of trucks with special design will help visitor reach the top of the mountain. Hope you and your beloved could have a nice trip in Myanmar!